The Orthodox Monastery of St Catherine stands at the foot of Mount Horeb where, the Old Testament records, Moses received the Tablets of the Law. The mountain is known and revered by Muslims as Jebel Musa. The entire area is sacred to three world religions: Christianity, Islam, and Judaism. 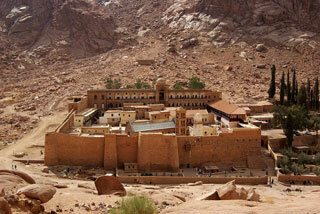 The Monastery, founded in the 6th century, is the oldest Christian monastery still in use for its initial function. Its walls and buildings of great significace to studies of Byzantine architecture and the Monastery houses outstanding collections of early Christian manuscripts and icons. The rugged mountainous landscape, containing numerous archaeological and religious sites and monuments, forms a perfect backdrop to the Monastery. This article uses material from UNESCO World Heritage List article "Saint Catherine's Monastery", which is released under the Creative Commons Attribution-Share-Alike 3.0 IGO License.